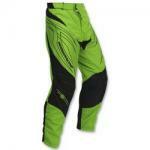 Choosing a pair of motocross pants might seem like a simple decision. Find a few pairs that fit your price range and pick the best looking ones, right? Only it’s not quite that simple. MX pants come in many different shapes, styles and sizes. And there are other factors to consider, such as durability, heat resistance, abrasion resistance and more. We’ll run down the factors you should consider when choosing a pair of pants to help you arrive at a good choice. 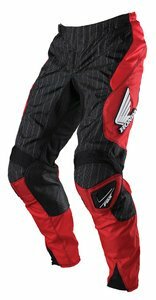 The safety of dirt bike pants comes down to three factors: what they are made of, what type of built-in protection they offer, and well they accommodate additional protection. You can find pants in a variety of different materials, each offering its own set of tradeoffs. Leather provides good abrasion resistance, but can be very hot. Perforated leather offers an improvement in airflow, but it comes at the cost of durability. Cordura is breathable and offers good abrasion resistance, but is somewhat inflexible so may not provide a snug fit. Kevlar provides superior protection, but is often expensive. Many pants have built-in knee or hip pads for added protection. If these are referred to as “panels”, it means that the material is reinforced for extra strength but still may not provide adequate protection. If you’ll be wearing any sort of additional knee protection, be sure that the pants can accommodate those. Safety is obviously one of the most important factors in choosing motocross pants so do spend a bit of extra time on this one. You’ll want pants that provide an adjustable, flexible and snug fit. A snug fit is important since you don’t want extra material flapping around and slowing you down. Spandex is a good choice for this, while Spandura provides the grip of Spandex with some of the protective properties of Cordura. You’ll want a flexible fit so that you can move freely without being restricted by your pants. Look for flexible stretch panels in all joints that expand when you move. Look for an adjustable fit since you may want to add or remove protective panels depending on conditions. 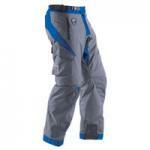 Look for an adjustable waistband and cuffs to accommodate protective gear such as a kidney belt and boots. Since you may spend a fair amount of dough on some pants, you’re going to want them to last. Look for pants that provide double or triple stitching on seams. 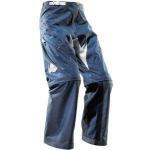 This allows the pants to sustain some amount of damage without falling apart. Note the type of fabric used in the seat and the knees — these two areas get the heaviest wear so are most susceptible to damage. Airflow often comes as a tradeoff with safety. The more rugged the material, the better protection it provides at the expense of being overly hot. Pants will often have strategically placed air flow panels that allow for cooling without sacrificing protection. Look for mesh panels. Spandex and Cordura also offer breathability. Of course you’ll want to look good in your pants too, right? Take note of how the pants co-ordinate with your bike’s colors. Will they look okay together? Are you trying to match other equipment, such as a jersey or boots? How will the pants look when you’re off the bike? If you look good, you won’t be in a rush to change out of them when you dismount. While pants that convert to shorts might not be a good choice for fit and safety, they will allow you to wear your pants off the bike, even in varying weather conditions. 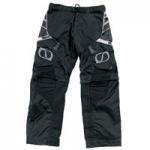 The factors above are probably the most important to consider when choosing MX pants. But there are still others as well. Look for pants that are lightweight so you’re not weighed down by your gear. Consider the pockets — are you hoping to store a few essentials while you ride? If so, you’ll need a few of those. The same factors as above apply for youth pants as well as adults. Take careful note of sizing, of course, since kids do grow fast! And you may want to emphasize safety even more in place of styling. That should be a possibility nowadays, since many pants are now available in youth sizes as well as adult. I don't care what your opinion is about personal protection gear for the daily ride, but riding motocross is different. You're going to lose some skin when you're not wearing the right apparel. Never going down means you're not trying hard enough. It's an expected (and nearly required) hazard of the sport. The 2008 Answer Mode pants are stylish and functional. For starters, they are convertible to shorts by zipping off the lower legs; the conversion is easy and can be made in just seconds. 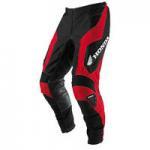 The Honda 180 Racepants by Fox Racing offer a combination of comfort and good looks while keeping your lower body safe.